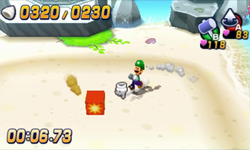 Mole Hunt is a minigame in Mario & Luigi: Dream Team. It is run by the Mole Hunt proprietor in a quiet area of Driftwood Shore. The minigame is only mandatory twice, though it can always be played again for ten coins. In this minigame, Mario and Luigi have one minute to obtain two hundred thirty points on the first mandatory play, two hundred fifty points on the second, and an infinite number of points in all subsequent plays. They must use the Mole Mario technique to dig up some hermit crabs with metallic-colored shells. Bronze shells are worth ten points and move the slowest, silver shells are worth twenty points and move at a moderate pace, and gold shells are worth forty points and move the fastest. All of the hermit crabs have a set movement pattern which Mario and Luigi can use to their advantage. There are also blocks functioning identical to POW Blocks that appear occasionally in random places on the field, and hitting them either with Mario's hammer or via Mole Mario will unearth all nearby hermit crabs. First mandatory play: 230 points for an Attack Piece. Second mandatory play: 250 points for the whereabouts of the Fly Guy R thieves that stole the Driftwood Jellyfish Sheets. 200 points for 200 coins. 400 points for 300 coins. 500 points for a Bare Hammer DX. This page was last edited on September 25, 2018, at 00:14.